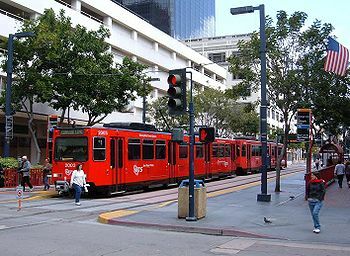 The San Diego LRT system after the reorganization of its route structure. Note: Route designations by letter are not used by the operator. Light rail lines: 85.6 km. Horse-trams: 3 July 1886 - ? 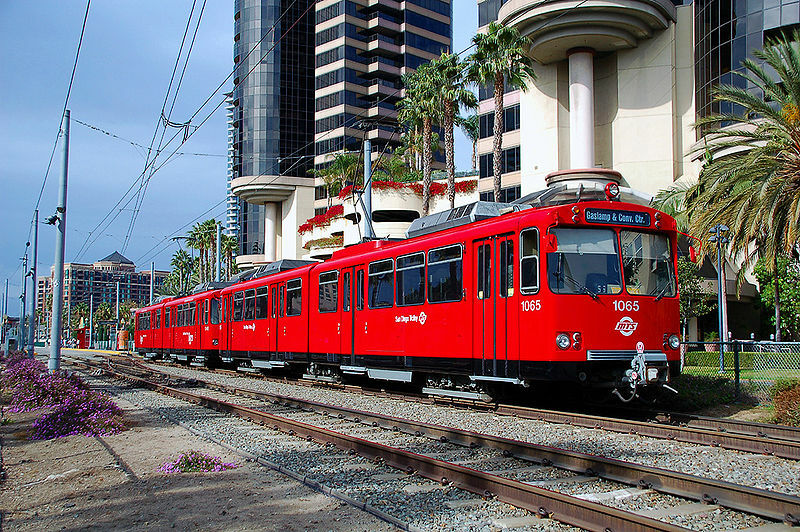 The San Diego Vintage Trolley, Inc. restores old San Diego streetcars and hopes to operate them in the future over the regular downtown San Diego Trolley tracks for touristic purposes. Mills, J.R. "Ten years of the San Diego trolley: A decade of success in California", Light Rail & Modern Tramway, Jan. 1992 (55:649), p.12-17. 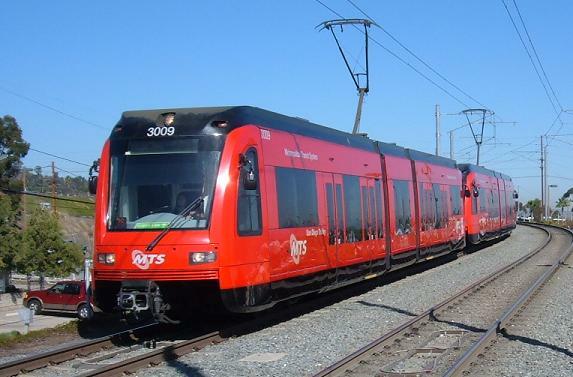 Rice, W. & Robins, K. "San Diego - Where red LRVs rule", Tramways & Urban Transit, Nov. 1999 (62:743), p.412-414. 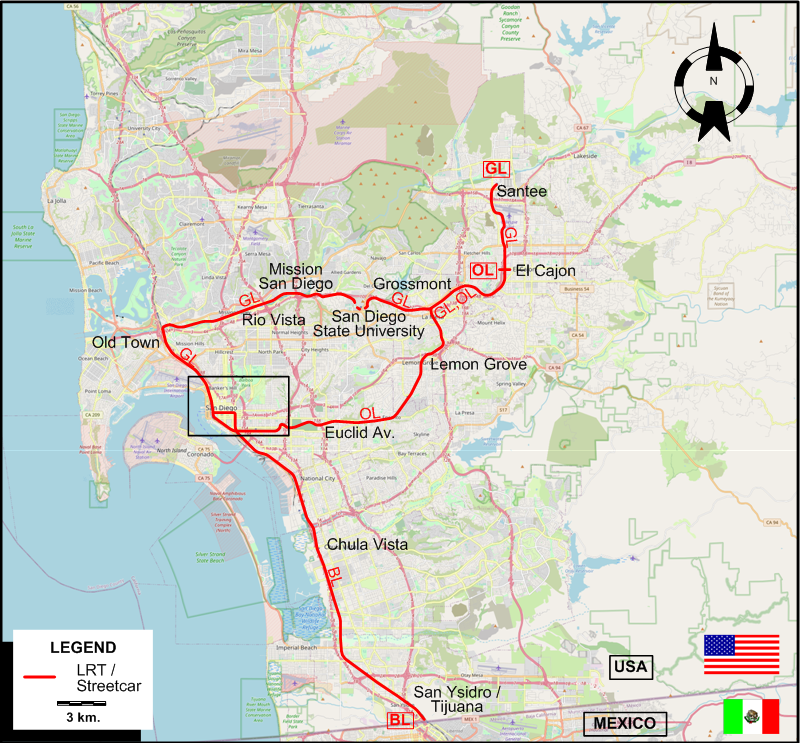 San Diego, California: Street guide & automobile road map. San Diego: San Diego Trust & Savings Bank, ca. 1930 and 1940. San Diego street guide. San Diego: San Diego Street Guide Publishers, 1941. Simons, V. "San Diego: A US original", Tramways & Urban Transit, Aug. 2013 (76: 908), p.344-347. Also, thanks to Rob Van Laun of San Diego for his kind corrections of my maps of the original San Diego streetcar network.